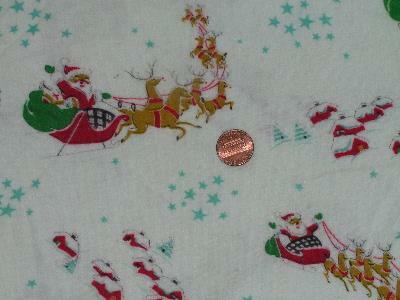 Vintage Christmas print cotton flannel fabric, Santa! Santa and his sleigh and reindeer, vintage 1940's print cotton flannel fabric, so soft and thick. Measures 2 1/2 yards, 36" wide, never laundered, has a little surface soil on the fold lines from storage.